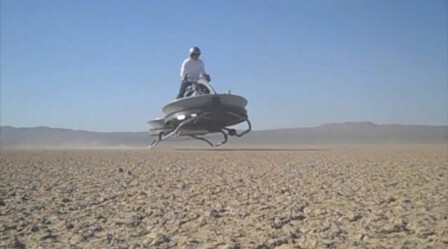 Science fiction once more becomes fact with the introduction of a Star Wars-like hover bike. It has been many a young boy’s (and girl’s) dream to zip around on one of the famous epic’s speeder bikes that were used by the storm troopers of the Galactic Empire and it now seems we are one step closer to those dreams coming true. 07.09.2012 - The company that’s developed the bike, Aerofax, has spent several years working on the project, which is based on a design that was abandoned in the 1960s because of stability and rollover problems. The issues were solved by creating a mechanical system, controlled by two bars at knee-level, which allows the vehicle to respond to the pilot's leaning movements and natural sense of balance. And as a recently released video shows, any small problems have been well and truly ironed out. The bike may not use anti-gravity, or even The Force, but its two ducted fans allow it to hover at a maximum height of 4.5 metres with a top speed of 50 kilometres an hour. The rider's tilting movements control the direction of the bike and one of the project's goals is to create a natural-feeling riding experience, like being on a motorcycle. The video shows the hoverbike zipping along and over a dry lake bed in the Mojave Desert in the United States and, although right now the Aerofex is only a prototype, it’s a fully functioning, extremely fun looking one. The company, based in California, intends to offer the design for military use first, so it’s not likely to hit the shops just yet, probably much to the disappointment of countless people. However its many possible applications include the transport of humans or materials over extremely rough ground, through dense forests or via ravines through which wheeled vehicles and helicopters cannot travel. Produced with news.CMS in 0,0732 seconds.